Warner Bros. Pictures has unveiled the final trailer for Aquaman ahead of its December theatrical release. 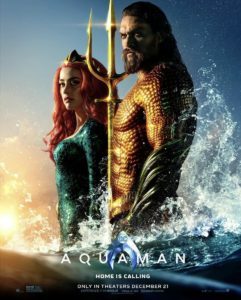 The 6th film in Warner Bros.’ line of DC films, Aquaman stars Jason Mamoa, Amber Heard, Nicole Kidman, Patrick Wilson, Willem, Yahya Abdul-Mateen II, and Patrick Wilson. Directed and co-written by James Wan (The Conjuring, Furious 7), Aquaman aims to not only move the character of Arthur Curry (Mamoa) forward, but the current state of DC’s extended universe as well. Judging from the recently released trailer, Aquaman is set to deliver an epic underwater battle as Arthur battles his brother Orm (Wilson) for the throne of Atlantis. Arthur will not only be faced with the wrath of his brother, but also the likes of Black Manta (Abdul-Mateen II) who is very comic book accurate in appearance. Additionally, this final trailer also gives us a first real look at Vulko (Dafoe) and the mentor-ship between him and a young Arthur. Much like Wonder Woman did in 2017, Aquaman will flesh out the origins of Arthur and see him develop from a young child into the hero we were introduced to in Justice League. Check out the final trailer below, followed by a recently released behind-the-scenes look at the upcoming film, and feel free to let us know what you think in the comments. Aquaman releases in theaters this December 21st.